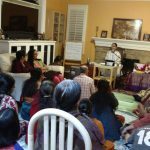 By the abundant grace and blessings of Sri Swamiji, Poornimaji’s satsang at Cary, North Carolina was conducted at the residence of Sri. Narasinga Rao and Smt. Veena Rao on February 12th 2012. 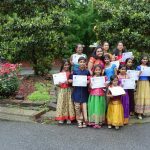 Poornimaji discoursed on the importance of attending a satsang and singing the divine names of the lord by citing examples from the life-history of Surdas. 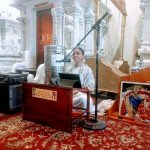 She laid down the ease of chanting the divine names and the goodness that one would reap by chanting the Mahamantra. 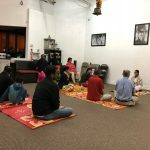 The devotees who took part in the satsang listened to Poornimaji’s lecture with rapt attention and enthusiastically participated in the Mahamantra chanting during the closing session. 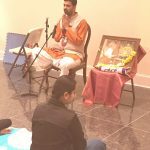 After listening to the discourse by Poornimaji, Namsankirtan satsangs have been started in Cary, North Carolina.